On the morning of June 24, cooperation promotion fair between Nanshan and China Transport was held in the conference room on first floor of NO.1 Villa of International Golf of Nanshan Group, Shandong Province Information Industry Base Office Director, Jining Economic Information Committee Researcher Wang Youbing, Jining Taibaihu New Zone Party Working Committee Secretary Zhanxin, Jining Taibaihu New Zone Investment Promotion Center Director Zhang Kai, Jining Taibaihu New Zone Xuzhuang Street Office Secretary Zhang Qiuren, Taibaihu New Zone Economic Development Bureau Deputy Director Zhao Hongyu, Taibaihu New Zone Office Chief Wang Hao, Taibaihu New Zone Investment Promotion Bureau Chief Gao Ang, China Transport Group Chairman and General Manager Qu Qing, China Transport Group Executive Vice General Manager Han Yong, Fan Peigong, China Transport Group Deputy General Manager, Shandong Shenhua Information Technology Co., Ltd. General Manager Sun Shijun, China Transport Group Network Information Company Operations Director Wei Ran, Shandong Shenhua Information Technology Co., Ltd. Technical Director Xue Lingbin and other leaders attended the meeting. Nanshan Group Chairman, Nanshan Education Group Vice Chairman Yang Haiyi, Nanshan Group Chairman Assistant Meng Xiangnan, Nanshan Group Office Director Wang Song, Nanshan Group Human Resources Director Gao Debing, Nanshan Zhongmei E-commerce Company Preparatory Officer Wang Kun , Nanshan Zhongmei E-commerce Company Technical Director Xie Guangming, Nanshan Zhongmei E-commerce Company Technical Engineer Sun Shouli attended the meeting. And hosted by Nanshan Education Group Vice Chairman Yang Haiyi. At the meeting, Nanshan Group Chairman made the welcome speech. Firstly, he on behalf of Nanshan Group expressed a warm welcome for the arrival of Director Wang, Secretary Zhan, Manager Qu and other leaders, and had high hopes for the future development prospects of the next step deepen the strategic cooperation between Nanshan Group and China Transport Group. Chairman said that China Transport Group as the largest and most powerful industrial enterprise in Shandong Province, was the benchmark for the development of industrial enterprises in the province. Nanshan Group and China Transport Group jointly invested in the establishment of Shandong Nanshan Zhongmei E-Commerce Co., Ltd, just a starting of the two sides to deepen the cooperation. The next step, Nanshan Group will carry out large-scale investment in Jining, and set up a joint venture company with China Transport Group to further increase the depth of strategic cooperation, broaden the cooperation areas, strive for carrying out greater space and higher level multi-field cooperation, and to maximize the both companies' development of achieving a win-win! Manager Qu on behalf of China Transport Group expressed thankful to Chairman and other leaders of Nanshan Group for their high degree of recognition and recognition of the e-commerce development achievements of China Transport Group. Manager Qu said that Nanshan Group as China 's top 500 enterprises, had a strong industrial base, and it was my Group company's honor to reached a deep strategic cooperation with Nanshan Group, the depth cooperation also attached great importance by the city's leadership. Thanked to Shandong Provincial Information Industry Office Director Wang and Jining Taibaihu New Zone Secretary Zhan and a number of leaders to participate in the fair, which was a great support for the development of China Transport Group. We would actively cooperate with the full support for the construction of Nanshan Zhongmei E-commerce Company. At the same time, we hoping that take the cooperation as an opportunity to increase the Nanshan Group and China Transport Group's strategic cooperation depth, through the next step set up a joint venture in Jining to strengthen in-depth cooperation of the two sides in many areas and numbers of large projects. I believed that through the strong combination of the two sides, hand in hand, the full support of Nanshan Group leadership, the cooperation between the two sides would be able to burst out of vitality and achieve greater development! At the meeting, Jining Economic Information Committee Director Wang made an important speech about the next step deepen cooperation of Nanshan Group and China Transport Group. He said that Yantai Nanshan Group had a strong industrial base and was China's top 500 enterprises, China Transport Group had rich experience in the e-commerce platform construction and operation, was the successful example of Shandong Province and even the national industrial transformation and upgrading, the cooperation between the two sides must be a strong combination, win-win choice, and lay a solid foundation for the next step to actively expand two sides cooperation in many areas and large-scale. At the same time, Director Wang pointed out that Nanshan Group and China Transport Group's strategic cooperation well promoted the Jining City and Yantai City in the information industry development and communication, and said to give strong support for the next step of Nanshan Group and China Transport Group to set up a joint venture in Jining. 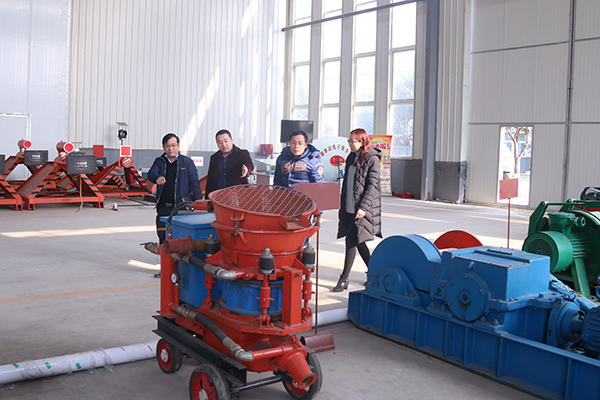 Subsequently, Nanshan Zhongmei E-commerce Company Preparatory Officer Wang Kun conducted a detailed report to the leaders of the meeting on the progress of preparatory work of the Nanshan Zhongmei E-commerce Company. At the meeting, leaders also discussed, considered, and reached a consensus to the new company related issues of the e-commerce platform development, the issues related to the collection of aluminum products, team building, personnel training, corporate decision-making, supervisory, management staffing, division of responsibilities, and China Transport Group E-commerce Leadership, professional and technical personnel treatment and other related issues. 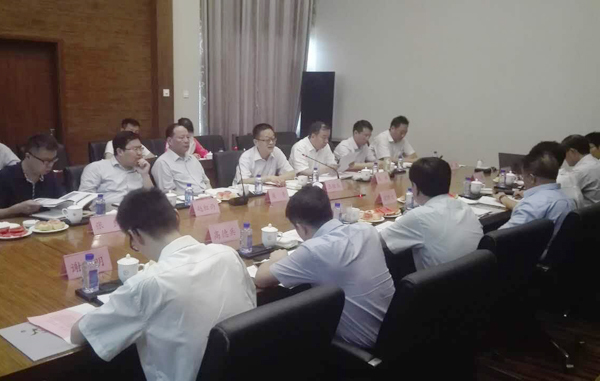 At the end of the meeting, the leaders of both sides discussed and reached a consensus on the establishment of Shandong Nanshan China Coal Information Technology Co., Ltd. in Jining. The new company will take fully use of China Transport Group outstanding advantages in the Big Data, Cloud Computing, On-line platform operating, intelligent city construction, industrial cloud services, enterprise IOII services, intelligent manufacturing integrated system services, industrial e-commerce etc, and the strong brand influence of Nanshan Group that as one fo China top 500 enterprises. Based on Jining, face to the whole province, and radiate to the whole country to carry out various types of Internet services, technological service for building a leading company in domestic and international information technology industry! The symposium further expanded and enhanced the influence of China Transport Group, and deepen the strategic partnership with the Nanshan Group, and played a positive role in promoting the two sides to actively expand in the next step multi-field, large-scale cooperation. The symposium was a complete success!